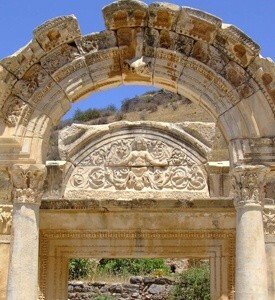 Antalya Aspendos Ephesus Pamukkale Cappadocia Istanbul. 11 days full of history and places of extraordinary beauty. 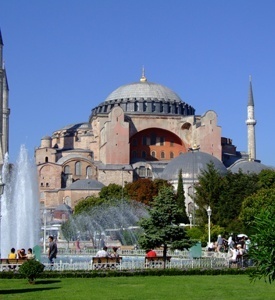 Full day tour to Aspendos and Perge, Full day tour to Ancient Ephesus and the house of Virgin Mary, Full day tour to Pamukkale, Full day city tour in Istanbul and a half day cruise to Bosphorus. Arrive at Istanbul Airport and take the connecting flight to Antalya. Arrive and transfer to the hotel. After breakfast, we will depart and visit Perge, the place where most of the statues that are on display in Antalya Museum were unearthed. 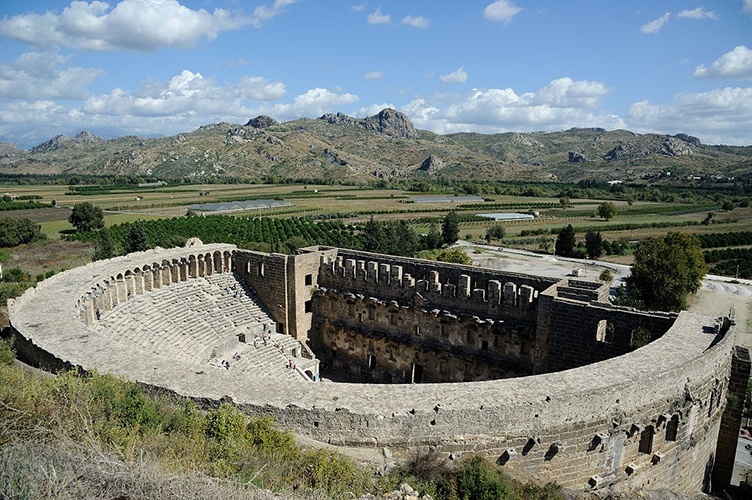 Then we will drive to Aspendos which was an ancient Greco-Roman city founded around 1000 B.C. It was located about 25 miles from the modern city of Antalya, and it’s known for having one of the best-preserved theatres from antiquity. The side was both a prosperous Aegean trading centre at Hellenistic and Roman times and a base for Cilicia pirates in the 1st and 2nd centuries BC. After lunch by the river, visit the beautiful Kursunlu Waterfalls which cascade over a cliff into the Mediterranean. After breakfast transfer to Antalya Airport for the flight to Izmir. 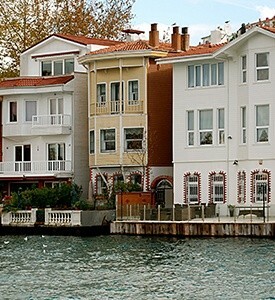 Arrive and transfer to Kusadası for dinner and overnight. The tour starting wi th Isa Bey Mosque, then drive to an ancient Greek city, later a major Roman city, on the west coast of Asia Minor which called Ephesus. stroll past the Celsius library, the Temple Of Hadrian and the Trajan Fountain in the Ancient Ephesus. After walking on the historical marble street the Great Theater where St. Paul preached will meet at the end. Open buffet lunch in a local Turkish restaurant. In the afternoon will visit the carpet cooperative to see how the Turkish carpets are made by hand. Proceed to the shrine of Mother Mary, it is believed where she spent recent years of her life. Temple Of Artemis (Diana), on the side of one of the seven wonders of the Ancient World. Drive to Pamukkale that has the meaning of the Cotton Castle in English. Once known as Hierapolis, famous for healing thermal/mineral Baths and beautiful snow-white “petrified waterfalls. 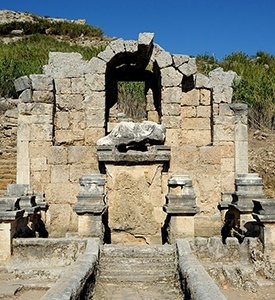 After lunch, we will visit Hierapolis, including the magnificently preserved Necropolis, the main Street and Gates, the thermal Baths, the devil’s hole, and Masterpiece Theater. 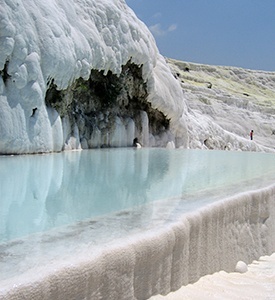 Pamukkale terraces are made of travertine, a sedimentary rock deposited by water from the hot springs. In this area, there are 17 hot water springs in which the temperature ranges from 35 °C to 100 °C The water that emerges from the spring is transported 320 meters (1,050 ft.) to the head of the travertine terraces and deposits calcium carbonate on section 60 to 70 meters long covering an expanse of 240 meters to 300 meters. After breakfast, transfer to Izmir Airport for the flight to Kayseri. Arrival and transfer to the hotel. 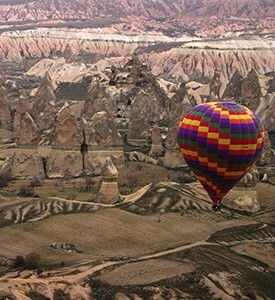 Dinner and overnight in Cappadocia. Depart from the hotel to visit Red valley through Cavusin and explore the famous rock-cut churches and hike 2 km. Then visit Cavusin village. Old Cavusin was abandoned several decades ago due to avalanches. The current village of Cavusin is located on the road. Old Cavusin, with its rock-cut dwellings and stone houses, had several hermitages. After lunch drive to the Pigeon Valley. In the afternoon visit Underground City, where early Christians lived in fear and faith. The houses in the village are constructed around the nearly one hundred tunnels of the underground city, which is one of the most interesting underground settlements in Cappadocia. The underground city was originally carved out as eight floors; however, four floors are available to visit. In wartime, about 5000 people can refuge in. The tunnels are still used today as storage areas, stables, and cellars. Half day cruise through Bosporus, the majestic strait that runs through Istanbul, linking Europe and Asia. From our cruise boat, we view the dramatic sights lining the Bosporus wooded shores: mosques, a bridge that for a time was the world’s longest and Rumeli Hisari, a massive fortress built by Mehmet the Conqueror in just three months as he prepared to take Istanbul. Also noteworthy on this tour are the 19th-century mansions of the Ottoman elite and the Sultans’ fanciful gingerbread palaces and hunting lodges Disembarkation at the European part of Turkey and transfer to your hotel.